Posted by Morgan in strongmen, tcktcktck. 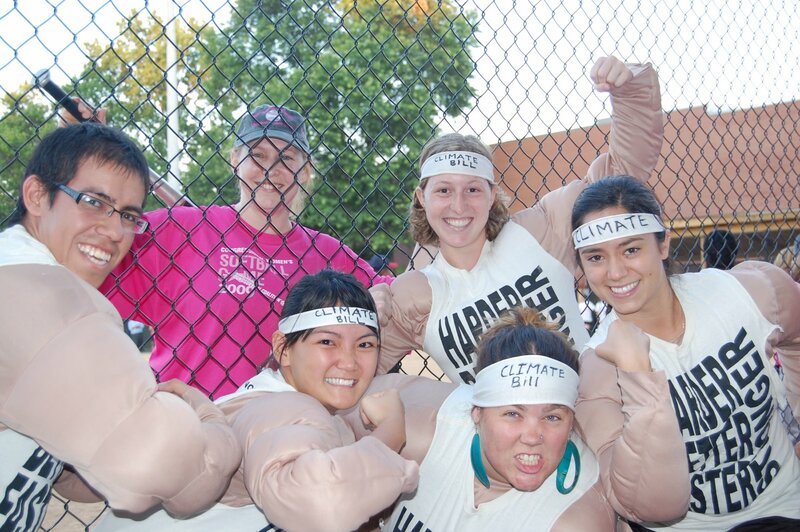 With climate-themed ball game cheers, the Strongpeople attracted much attention and joined Gillibrand’s staff in pumping her up throughout the game. She seemed to recognize the Strongpeople, having seen them in the morning at an Environment and Public Works hearing. After the game, Gillibrand was excited to shake all of the Strongpeoples’ strong, muscular hands as they congratulated her on her excellent pitching and batting skills. The Strongpeople told her how much they are counting on her to “hit the climate bill out of the park too” and be a climate champion. They gave her a commemorative bat with information about ways to strengthen climate legislation and lead the US toward a global treaty in Copenhagen. The Senator thanked the Strongpeople for their advocacy and accepted the gifts graciously. Senator Gillibrand is in a unique position to be a climate champion in the senate. She sits on the three committees that will probably play the largest role in piecing together a bill: Environment and Public Works, Agriculture, and Foreign Relations. To date, her statements on climate change are encouraging, including a recent indication that she “will use every bit of persuasive power” to restore the EPA’s authority to regulate pollution from old coal-fired power plants in the Senate version of the bill. This important EPA oversight is not included in the House-passed Waxman-Markey bill. Given that she sits on Foreign Relations as well as EPW, Gillibrand is also poised to help strengthen international finance provisions for adaptation and clean tech transfer. These oft-forgotten components of a US climate bill will mean a lot at international negotiations, and whether or not Gillibrand will lead in these areas as well remains to be seen. Tonight, Senator Gillibrand played hard and even scored a run. The Strongpeople hope to see her do the same if not better in the Senate as the climate bill moves forward. In this morning’s Environment and Public Works Senate committee hearing, Avaaz.org youth once again pushed for HARDER oversight of dirty coal plants, BETTER funding for international adaptation and clean tech measures, FASTER 2020 emissions reduction targets, and overall STRONGER domestic climate legislation leading up to Copenhagen. 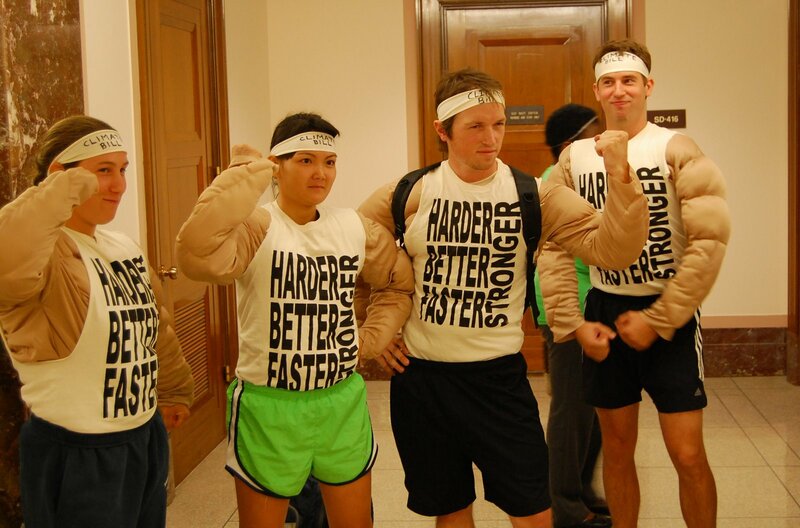 Six youth dressed in muscle suits and “HARDER, BETTER, FASTER, STRONGER” work-out tees filled a full row in the hearing room, and came face to face with Senator Boxer and other committee members. The “strong” visual brought whispers of interest and cell-phone photos from hearing attendees and press. The strongmen/women also let out a burst of clapping after one witness’s testimony about the need to put a cap on carbon emissions. In response, Senator Boxer thanked demonstrators for their presence despite calling for order in the room. After a drawn-out debate over nuclear plants between the Chairwoman and Senator Alexander, the Avaaz strongmen/women stood in unison and slowly filed out of the room, creating a human wall of the STRONGER message. The presence at today’s hearing follows Avaaz’s current theme: over the past week, the strongmen have visited another EPW hearing, delivered 5-pound barbells to committee member offices, created a “STRONG” aerial photo, and performed a core strengthening workout routine in the offices of primary targets. With their continued coaching, hopefully the senators will beef up and flex their legislative muscles to pass a strong climate bill. 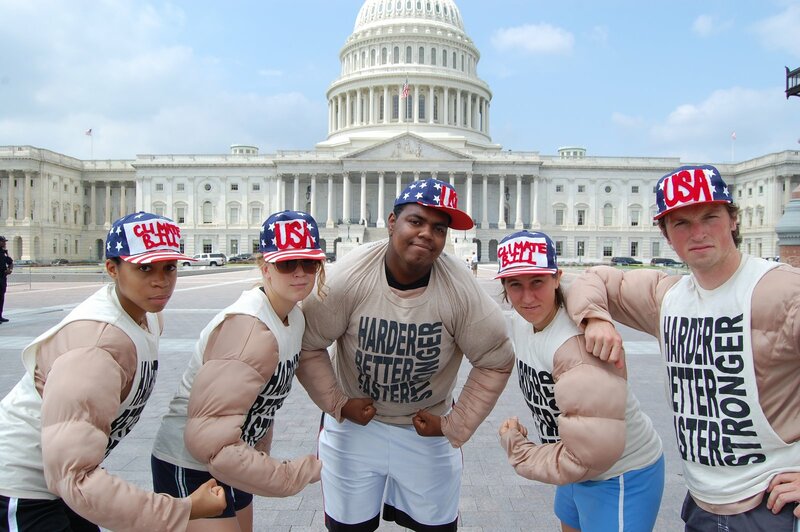 Stay tuned for another appearance of Avaaz’s strongmen and women. Posted by Morgan in climate bill, strongmen, tcktcktck. 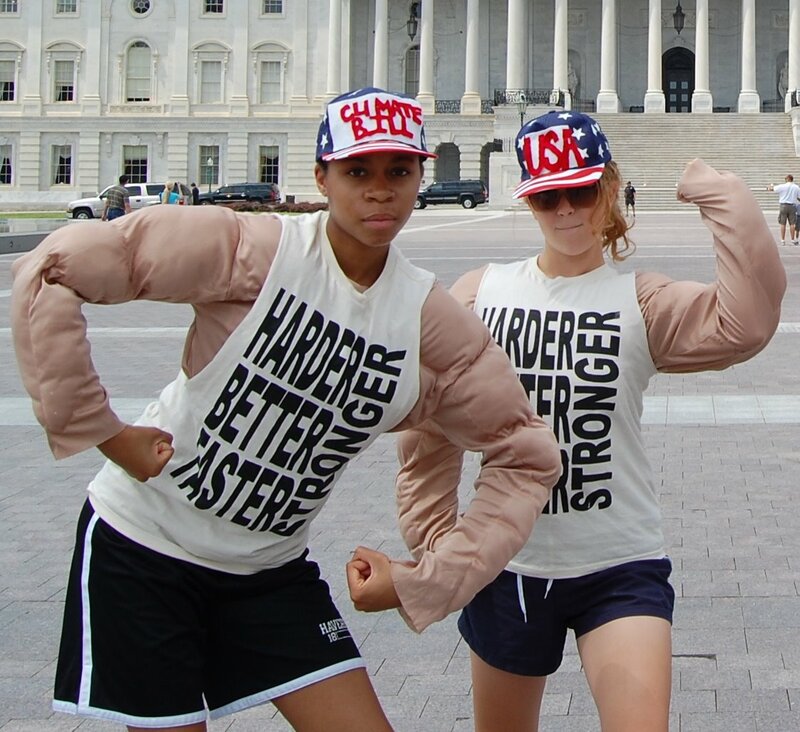 This morning, half a dozen youth in strongmen costumes showed up to pump iron and flex their climate bill “muscles” in Dirksen 406. Why? Because the first post-ACES Senate Environment and Public Works Committee hearing on climate legislation took place there at 10 am today. I was surprised to see such a clever ploy espousing that Congress must pass a stronger climate bill than the American Clean Energy and Security Act (ACES), which was passed by the U.S. House of Representatives last Friday, June 26th. 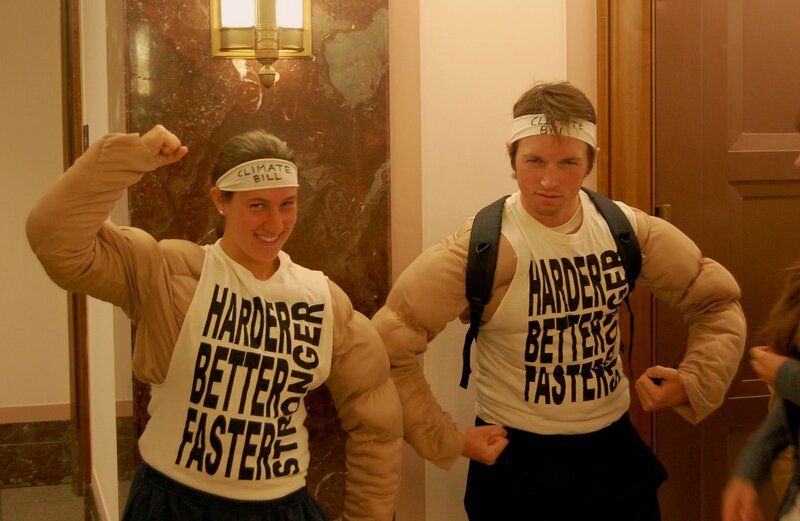 And, if the muscle suits didn’t allude to the issue enough, each muscleman wore a t-shirt with “Harder, Better, Faster, Stronger” on them. The popular song by Daft Punk, later remade by Kanye West, correlated with the more specific asks of harder oversight on coal plants, better renewable portfolio standard and investments in international adaptation, faster emissions reduction targets and, more generally, stronger leadership and a stronger bill. The connections between a total body workout and creating a binding treaty were both humorous and clever and I personally thought it was amusing to have a play off of the American culture of desiring a fit body by eating hamburgers and drinking diet soda. This, much like our current climate bill and Congressional process, is not a way to achieve our “target weight.” It is wonderful to see the youth climate movement pushing our senators to be more aggressive right off the bat with the first hearing in a fun and witty way that turns heads and demands the real targets our national and international communities need.